This week, I managed to tick off a rather lovely one of my 35:35 Challenges and finally eat at Create, a restaurant in the centre of Leeds. Not just a restaurant but a social enterprise too, offering jobs and training to people who have suffered from long term unemployment. Of course the social enterprise part would be all very worthy but not enough, if not backed up by great food. Thankfully, as reviewed by everyone from Twitter friends to Jay Rayner, the food is excellent. Truly excellent. At the moment, there is a lunchtime offer. Two people, two courses, £18.50. Incredible value for such lovely food. Which is why the place was full on Wednesday lunchtime! I’m clearly not a restaurant critic or food writer. I have some very odd favourite foods. I do like food a lot though (which is why I’ll never be waif-like) and therefore feel that I have enough of an opinion to comment. 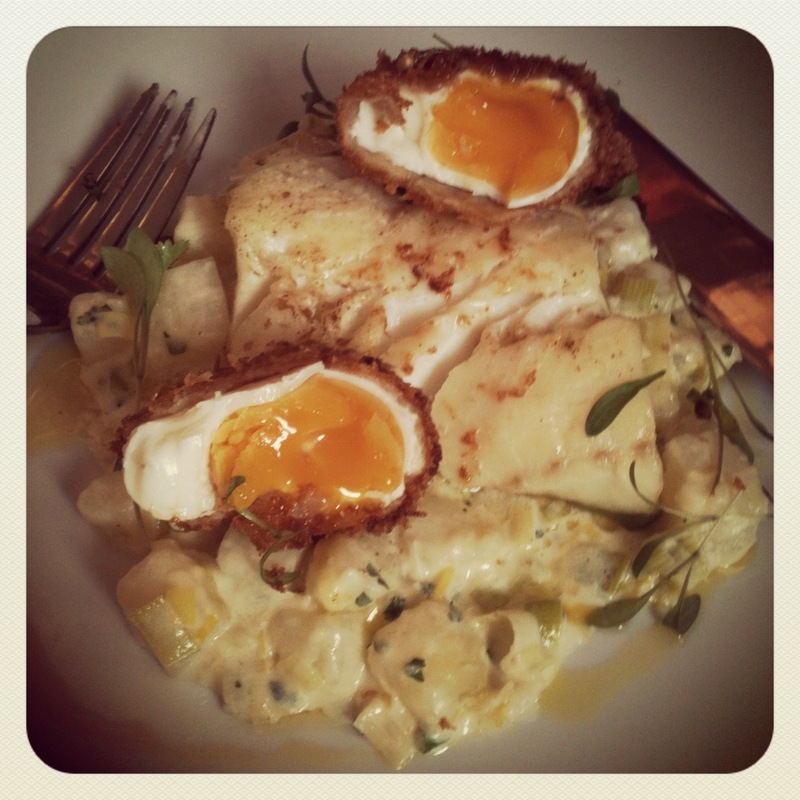 I had a spelt pumpkin risotto to start and then (as recommended by the friendly waitress) smoked haddock topped with an amazing fried poached egg with leeks and potatoes as main. The risotto was a great size for a starter, the texture was lovely and the goats cheese mixed in with the pumpkin gave it a lovely little bit of sharpness amongst the creaminess of the spelt. My haddock was perfect. Smoked without that horrible yellow colour, thank goodness, and topped with a perfectly poached and still-soft egg, it was a plate of pure pleasure to eat. Just thinking about it again is making me hungry! My lunchtime companion had a pumpkin bake as a main course followed by a shiny pale pink rhubarb pavlova dessert. She said that everything was lovely too. The main problem I had was in choosing what to eat. I always approach every food-choosing opportunity as if it were my last meal ever. One day, in the hopefully VERY distant future, it will be. I really do need to get over it every day though. The other thing I struggle with is the dilemma of whether to choose something I know I love, and will therefore enjoy, or something that I’ve never had before. This obviously is a bit risky, as it could turn out to be horrible. However, like I say to my kids – you’ll never know if you like it if you don’t try it! 1 – Sometimes a sandwich is just a sandwich. Something to keep me from hunger. I am obviously grateful for this, but I don’t need to take all day deciding between egg or cheese. Seriously. 2 – When eating out in a restaurant, if I’m only having one course, I will pick something I know I like. If I’m having more than one course, I’m going to make sure I include something new. Life is supposed to be a series of new experiences, after all!